The apt. situeted is in the center of Venice, Via Garibaldi - Castle in one of the best area in Venice, in cui you can find every kind of shop just down stears (supermarket, bar, restaurant, Pharmacy, Bank etc.). 200 m from boat station, very easy to reach, 200 m. from the Venice Biennale, 10 minutes from the beach, 5/10 minutes walking from San Marco Square, 20 minutes by boat from train station or bus station; if you come from Venice Airport there is a boat called ALILAGUNA That you stop in front of the apartment just 200 m. It's situeted in one of the best position to start to visit the city. Easy walking distance to the vaporetto stop this lovely apartment was perfect for our 4 night stay in Venice. It was cozy and very comfortable. Christiano met us at the Arsenale stop and accompanied us to the apartment. We would highly recommend Christiano and this apartment for your stay in Venice. First of all, do not hesitate to book this apartment! The location can't be beat; it is on a relatively quiet street with great bars and restaurants, but away from the main tourist areas. However, you are within a very quick walk to San Marcos and other attractions. The apartment is spacious and the air conditioning worked great which is important in August. Cristiano is a fantastic host who is very quick to respond to questions and make recommendations. His mother met us at the boat stop and we were able to check in early which was great after a long flight. The only reasons for four rather than five stars is the bed and shower. It's impossible for an owner to have a bed that suits all tastes. This bed though was rather thin and creaky. The shower certainly got the job done but was small and a bit dated. Again, do not hesitate to book this apartment. If I were to return to Venice, I would absolutely book again. Thanks, Cristiano! 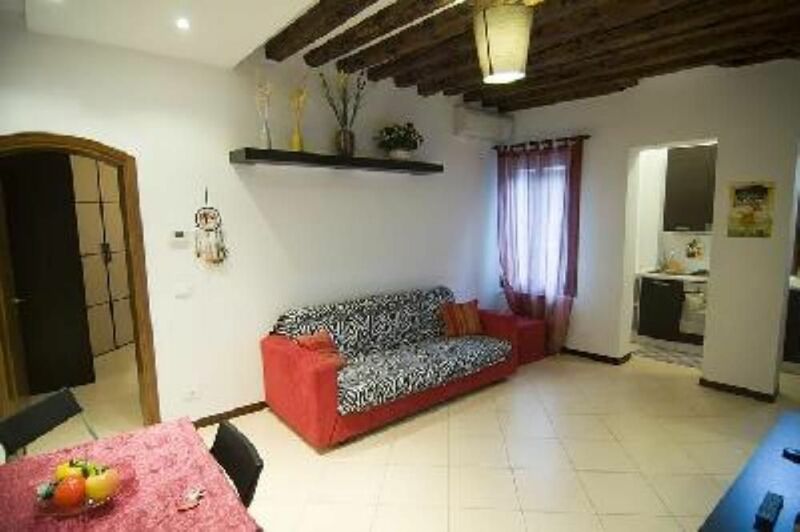 Lovely apartment in quiet, wonderful part of Venice. We totally loved our stay in this apartment in Venice. We was warned about visiting this fabulous city in July, due to the crowds of tourists - but the Castello location was absolutely fantastic. We could really enjoy the charm and lights and qualities of the city, and not far to walk to the centre when / if we wanted. The water bus passes was well worth the cost, and was a amazing way to travel between the different parts of the city if we did not want to walk. We loved our three days in Venice - and will recommend this appartment to everyone who wants to visit the city, even in the busy summer months! The property was very well equipped, well maintained and in an excellent area. Tariffe scontate in relazione alla durata, Tariffe in funzione del numero di persone, Caparra richiesta alla prenotazione, Consegna delle chiavi da parte del Proprietario non presente in locorietario Per Soggiorni inferiori alle 3 notti i costi delle pulizie finali sono a carico del cliente ( 20/30euro ) tassa di soggiorno ( city tax ) da pagare al check in : 3,00 euro per notte per persona bambini esclusi sotto i 10 anni .